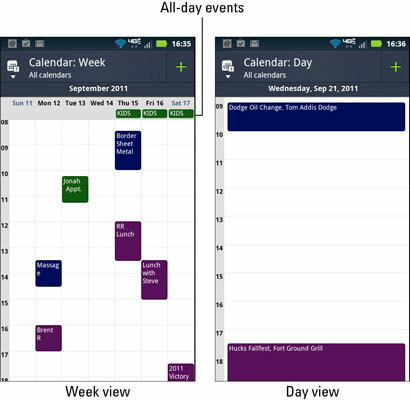 Date books might be effective, but they pale in comparison to the power of using your Droid Bionic as your calendar and date keeper. Your phone can easily serve as a reminder of obligations due or delights to come. It all happens thanks to Google Calendar and the Calendar app on your phone. If all you need is a to-do list, check out the Tasks app, found on the Apps menu. It offers a simple interface for creating tasks, “honey-do” lists, and reminders. The Droid Bionic takes advantage of Google Calendar on the Internet. If you have a Google account (and surely you do), you already have an account with Google Calendar. You can visit Google Calendar on your computer. If necessary, log in using your Google account. You can use Google Calendar to keep track of dates or meetings or whatever else occupies your time. You can also use your phone to do the same thing, thanks to the Calendar app. Use the Calendar app on your phone to access Google Calendar. It’s a better way to access your schedule on the Droid Bionic than using the Browser app to get to Google Calendar on the web. 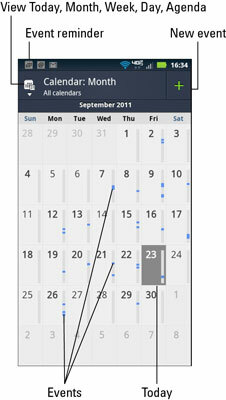 You can install the Calendar widget on the Home screen for quick access to looming appointments. To see your schedule or upcoming important events, or just to know which day of the month it is, summon the Calendar app. Touch the Launcher button at the bottom of the Home screen to display a list of all apps on the phone; choose the one named Calendar. The first screen you see is most likely the Calendar’s Month view, shown here. The calendar looks like a typical monthly calendar, with the month and year at the top. Scheduled appointments appear as colored highlights on various days. Use the View button to view your appointments by week or day. You can choose the Agenda item from the Change View menu to see your appointments in a list format. This figure shows both Week and Day views in the Calendar. In that view, you can see the color coding used to identify different calendar categories.